Scots may not be getting the best of the sunshine but they’re making the most of the local seasonal fruits, after data from supermarket chain Asda and Scotty Brand reveals strawberry sales are soaring. 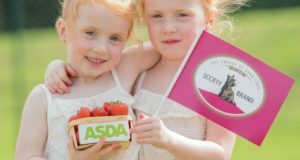 Scotty Brand strawberries, which are grown by Bruce Farms in Perthshire, have become a favourite for Asda shoppers, with record numbers being sold in stores. Last summer Scotty Brand sold nearly 4 million of the red berries and this summer Asda expects Scots to consume 75 tonnes of strawberries from June to August, equating to 800kg of strawberries per day. June Rose, fresh buyer for Asda Scotland, commented: “Year-on-year, we’ve seen sales of strawberries grow, with an expected peak around Wimbledon and the summer season. Michael Jarvis, head of marketing at Scotty Brand, added: “Demand for Scottish berries is growing and we work very closely with Bruce Farms to ensure our strawberries are tastier, fresher and keep better for longer. Scotty Brand strawberry punnets are available in Asda stores across Scotland priced at £1.50.